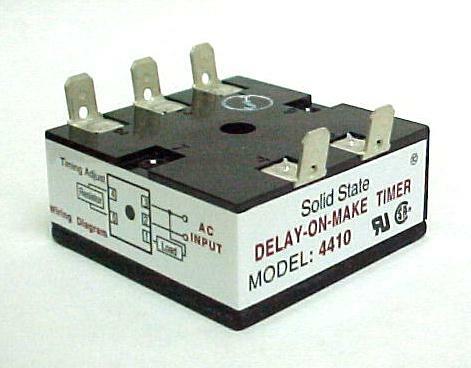 The model 4410 is a delay on make timer that switches AC load currents up to 10 Amperes employing zero voltage switching techniques. Zero voltage switching reduces electrical noise as a result of the load circuit being energized at zero degrees in the AC cycle. In addition, most load circuits will provide a longer life as a result of this zero voltage turn on. Operating Voltage 24, 48, 115, or 230V AC at 50 / 60Hz. Output 50 milliamperes to 5 Amperes inductive (10 Amperes with heatsinking) with inrush current to 40 Amps for 8 ms. Timing Range Adjustable or fixed timing available from .1-8000 seconds. See time chart below.